I’ve been having so much fun knitting these adorable baby hats. The results are almost instantaneous as they don’t take long to knit up at all. 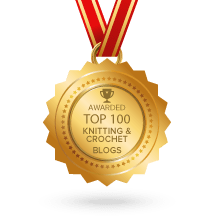 I found all but one of these patterns on Ravelry…..such a wonderful source of patterns for knitters and crocheters alike. This little hat is from the pattern Three Textured Baby Hats that features three hats of which I have made two. This one is the King Charles Brocade pattern. I used this lovely pink Bella Baby Honey DK yarn which is so incredibly soft and snuggly. The pattern definition is quite striking. 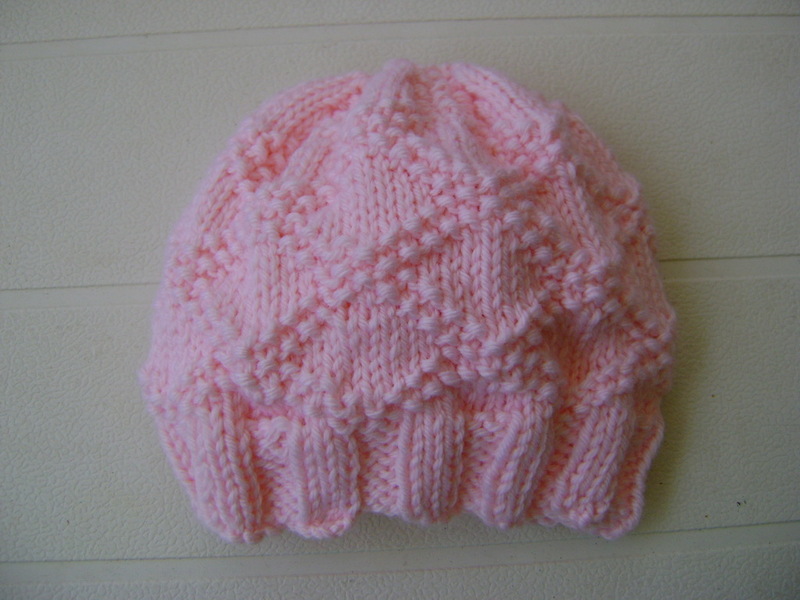 This is the second hat from the same pattern called English Diamond Block. It is knitted from Patons Big Baby 8ply in a lovely mid green colour although the camera has captured the colour as blue. Both these patterns are knitted from the brim up and are so easy once you’ve got the hang of knitting with dpns which I now have. This intricate looking pattern hat is called Baby Leaves Hat and is designed by Paula Dean Nevison. This pattern took a bit more concentration but if you look closely you can clearly see the leaf design. Very clever I must say. I used Patons Big Baby 8ply in a nice bold red colour which would suit either a baby boy or girl. 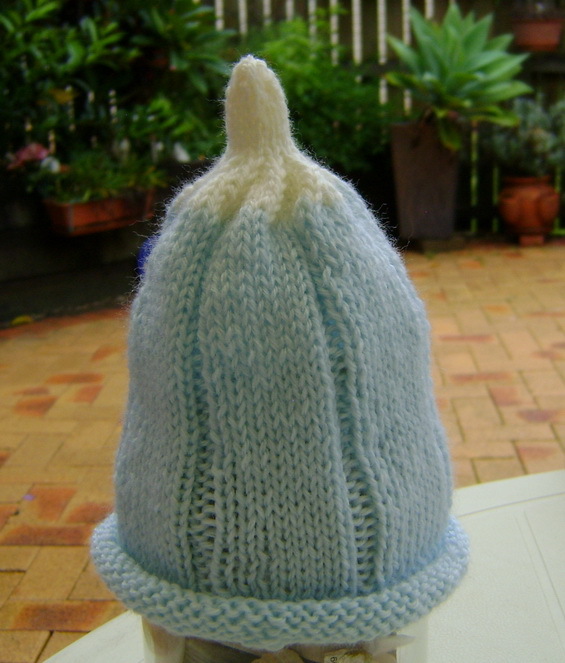 The hat starts from the crown with 8 stitches – 2 stitches on each of four needles….a bit fiddly to start with. 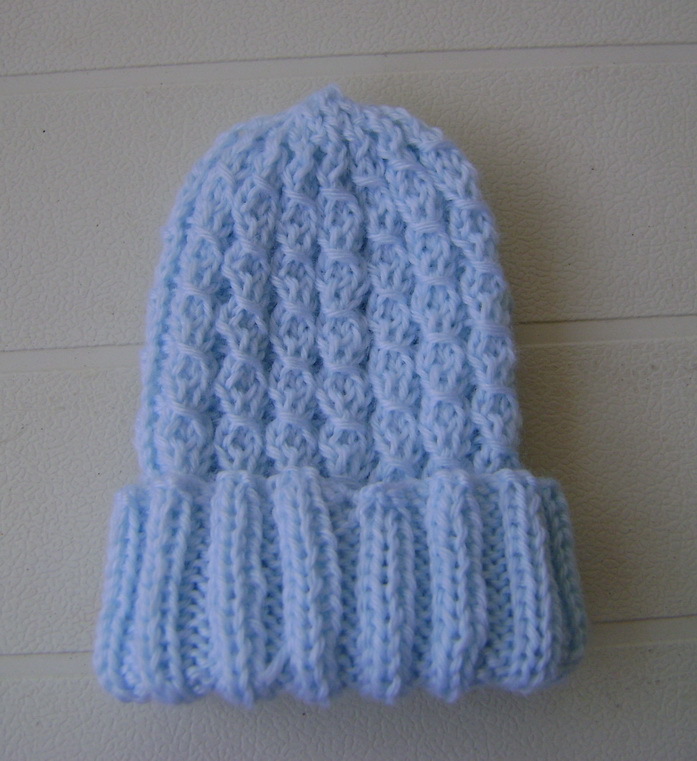 Because I loved the Mock Cable Baby Hat that I blogged about previously, I decided to make another one using Patons Big Baby 8ply in this lovely soft baby blue colour. 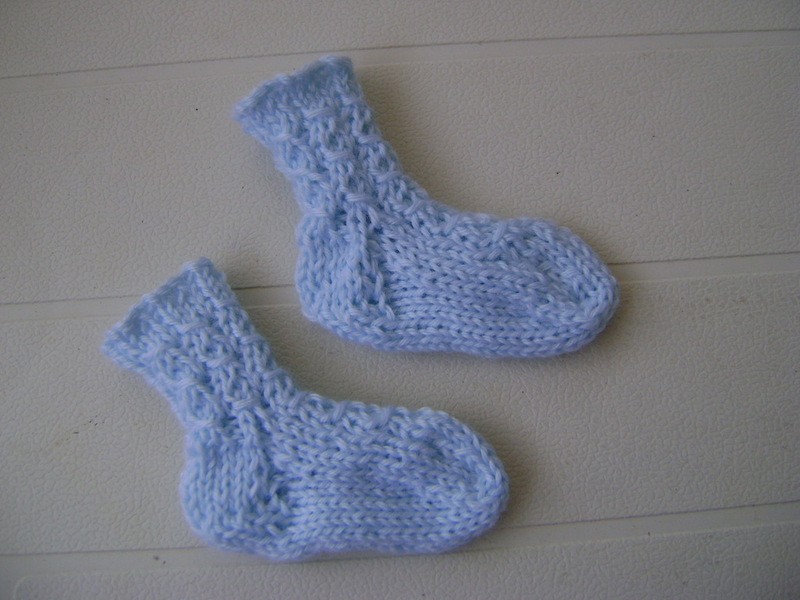 I just love this pattern so I entered the words ‘mock cable’ in the pattern search engine in Ravelry and found this adorable pattern called Mock Cable Baby Socks. 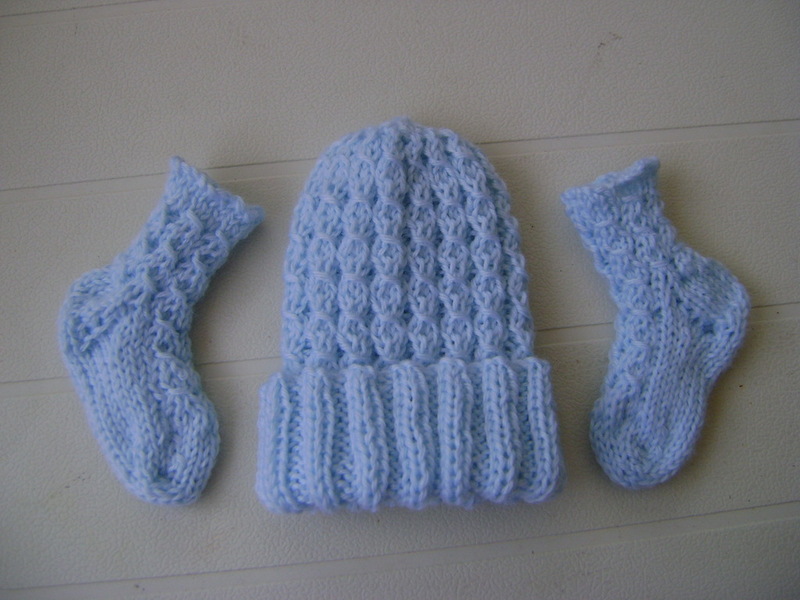 I used the same yarn to make a hat and sock set. I couldn’t believe how quickly each sock knitted up compared to knitting socks for big people! Now this hat is the pièce de résistance. The pattern is from the ‘Knitting: 100+ Patterns Throughout the Year: 2012 Day-to-Day Calendar’ and is called Ribbed Pumpkin Hat. It’s sized for a toddler so I’ll be giving it to a little boy called Reid who turns one in July this year. Isn’t it just as cute as a button! 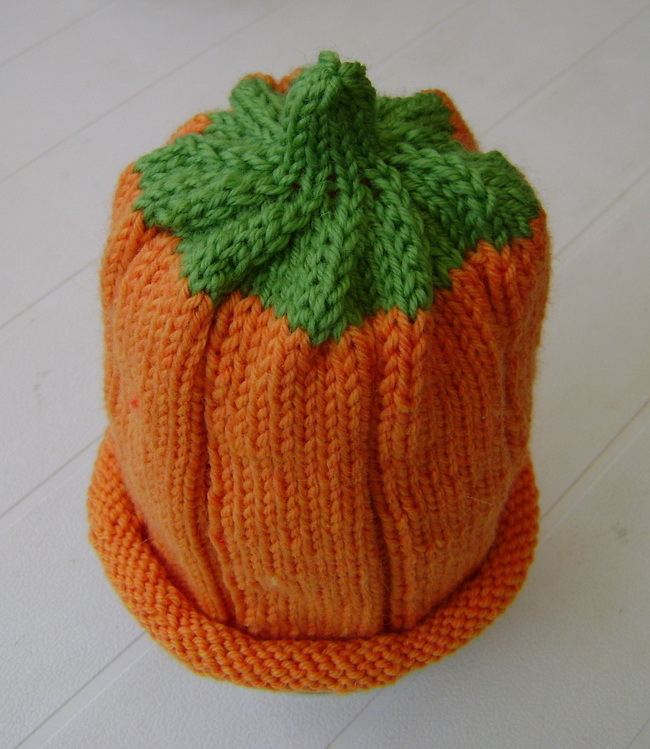 The pumpkin hat is made from Cascade 220 Superwash which is a pleasure to knit with……so soft. 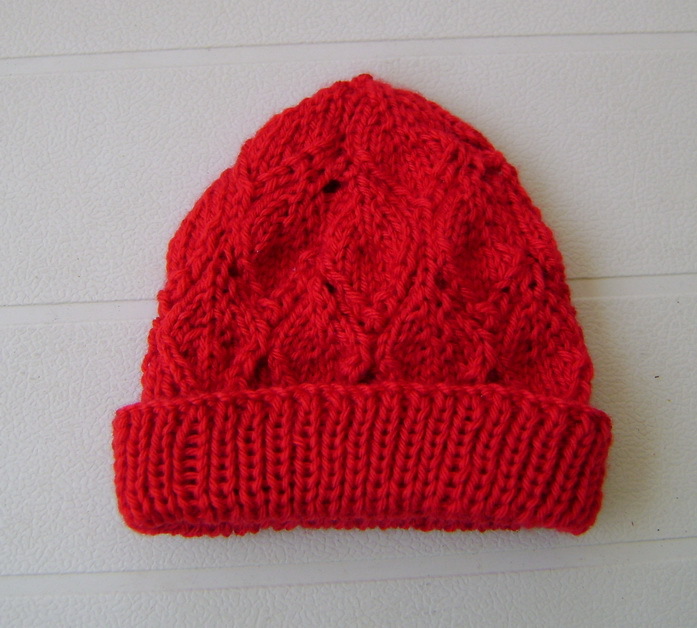 I loved this hat so much I decided to adapt the pattern to make a pumpkin hat for a newborn so I cast on 70 stitches (instead of 80) and only knitted the ribbed section for 4.5 inches as opposed to 5.5 inches for the toddler size. I’m so happy at how it has turned out. I used Patons Big Baby 8ply using pale blue for the main part and white for the top. This hat is sooo easy to make. 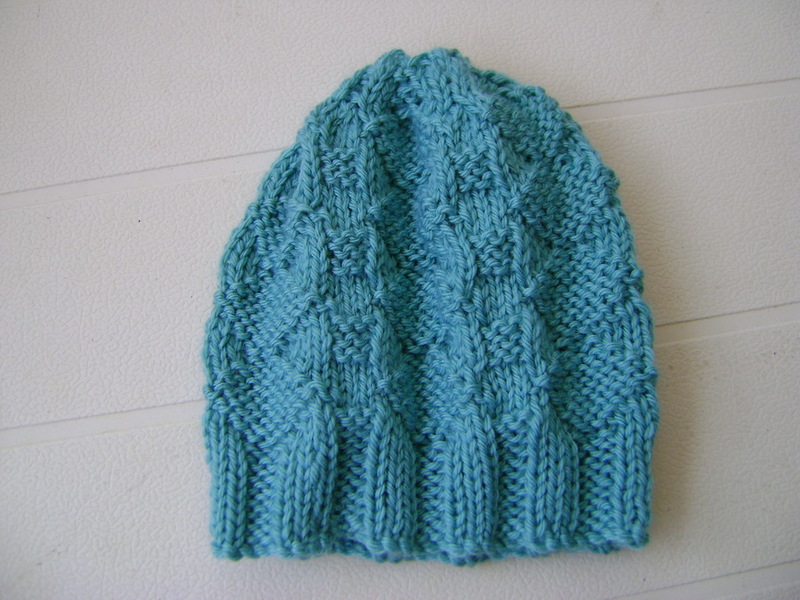 If you know how to cast on, knit, purl, knit through the back of the loop, knit 2 together and cast off, you can each make this hat. Plus, of course you also need to know how to knit with 5 dpns. Did you notice the five rings on the brick? If you look closely you’ll see ‘1956’ as well. That’s right this brick was made especially for the 1956 Melbourne Olympic Games which makes it 57 years old this year! 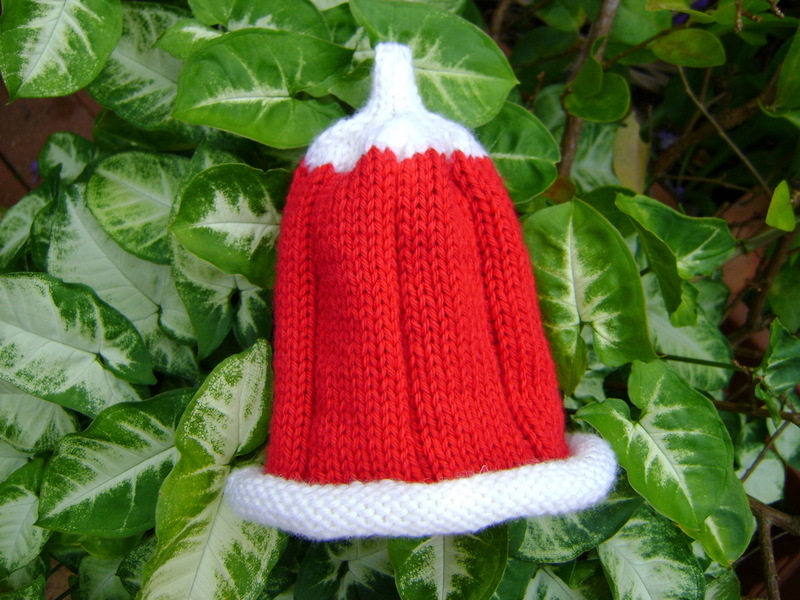 How about a red and white hat….reminds me a bit of Christmas. 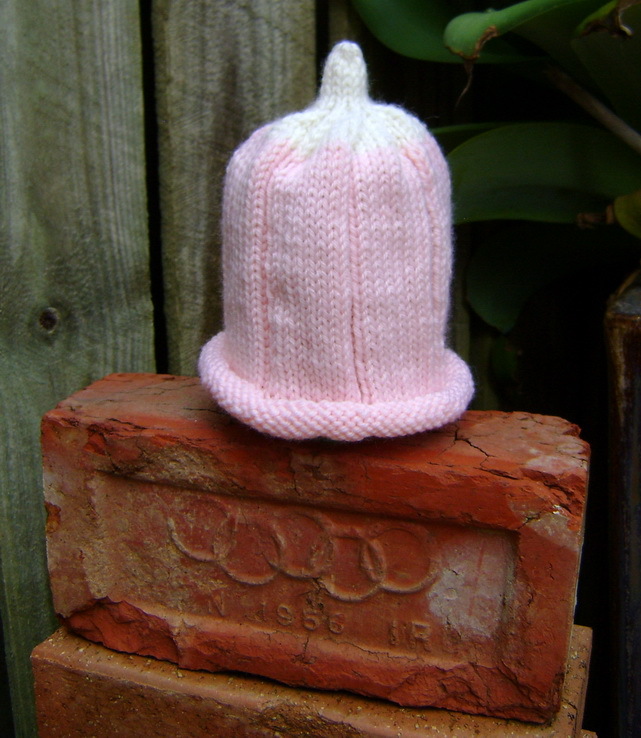 And just to finish off…..here’s a collection of all the baby hats I’ve made so far. I love them all and can’t wait to see them on two little babies. I probably should make a couple of jackets and finish the baby pram blanket I started but I’m having so much fun knitting these hats. Luckily, I’m knitting for two babies. At the rate I’m going they’ll both have a hat for each day of the week! And that’s exactly how many I have knitted to date! Talk to you soon. Have a wonderful week….